I hope you are all well and enjoying life to the full. I am very slowly catching up on jobs and am now sending out a news for February/March. More will come eventually. In the meantime I am taking a holiday and will be back to it in late May I hope. Many many thanks again for your continued support. We are growing all the time and there is always lots to do and learn for us as our students grow up and we try to help them to find the best option for them. We can do nothing without you all. I arrived back in Kigali in early January, expecting to open the school on the 9th, admitting new children to the nursery and helping the Primary children to get into study mode. However it was announced that all Primary teachers were required to attend residential training for 10 days so we had to reschedule everything and state schools did not actually open until January 23rd. This means they had been not been in class for 12 weeks. I spent the unexpected free time doing many things, in particular catching up with the older secondary students. I had decided to take them to Akagera National Park, a small reserve, much reduced by the need to allocate land for returning refugees, but a place where many different game species can be seen. We decided to have a sleepover so we could get an early start, the boys sleeping on the floor of one classroom, the girls in another. Needless to say, none of us slept for very long. We had a 5 a.m. start, hoping to arrive at daybreak, which is a spectacular sight as the sun comes up over a rare unoccupied stretch of land. Looking at the students, who now have very strong friendship bonds, I tried to remember them as very small children coming into the nursery from 2008 onwards. It is very gratifying to see how strong and healthy they are, how confident and mature, generally helpful and kind with each other. At one point we were able to get out of the coach at a place by one of the lakes. For some of the students this was the first time they had seen a stretch of open water. We were able to see crocodiles at the water’s edge and later, from the coach we saw plenty of other animals, including elephants, but sadly no sighting of the recently introduced lions. I hope our day raised awareness of the need to preserve our precious wildlife. A main source of income for Rwanda is tourist dollars from people visiting the gorillas. Not all visitors go to Akagera National Park, but there is much to see, including many species of birds. 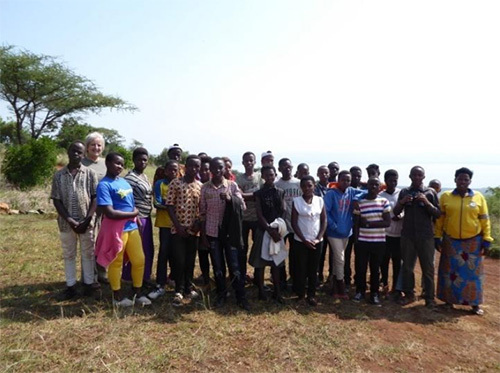 Once back in Kigali we had plenty to do to get all things together for the next batch of secondary children who were transferring to boarding school. They have to take everything with them, bedding, notebooks, a specified number of toilet rolls, pens and pencils etc. Traders in the city take advantage of people needing to buy essentials, including a box to put everything in and a mattress, so prices go up, seemingly on a daily basis as the departure date approaches. We try our best to be prepared but we have to move quickly as we have only about 10 days to find a school after the results comes out. Students with the highest marks are allocated a school of the Government’s choosing. Other schools will take children if their marks are good enough, some more willing to take lower scores than others. Thankfully we managed to place all our students. At the same time our Senior 3 students took a further set of National Examinations. Before taking them they were asked to nominate options for further study, for example Physics Chemistry and Biology PCB, Maths Economics and Geography MEG I have not seen any options for languages or arts. The students took the examinations and depending on the results were allocated schools and study options. Curiously none of the placements reflected the preferred options of the students. It is difficult to change anything but we did manage to place one student to study what he had originally chosen. I am proud to be able to say that I have been able to introduce one of our students to Green Hills Academy where he took and passed the entrance examination for a scholarship to study there for Cambridge International Examinations in Senior 10 and International Baccalaureate Examinations in Year 12. Green Hills Academy is where the President’s children were educated. Our student is a real trailblazer for us – a huge weight on his shoulders, which, he tells me, he gladly bears! I believe that sport is an essential in early development, which is why I am keen to find coaches for different opportunities. There is a growing understanding of the importance of sport in Rwanda, but it is not on the curriculum in schools. We have been lucky to meet representatives of the organization known as Cricket without Boundaries look for Eric Dusabemungu Hirwa on their website cricketwithoutboundaries.com or see them also on facebook. Through Eric and the sponsors of the girls I have been able to secure placements at a secondary school which offers cricket training. I am happy to report that they have done well in their first term and they have already been chosen to play in a young women’s team playing in a league. Such a wonderful thing for them and a fine example to others in our project who come to us thinking they are of no value, with no hope, no chance to change anything. It is always emotional, packing up and sending them off, hoping they do well, knowing we have done the best we can. 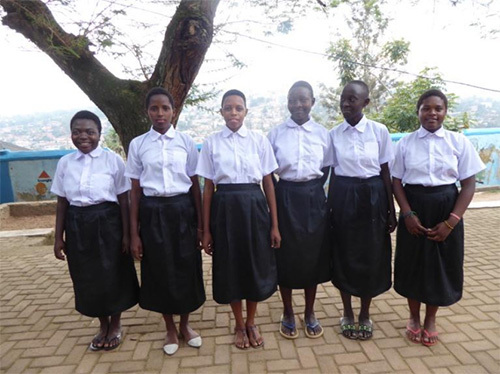 Secondary boarding is a toughening experience, but at least they have the opportunity to study in the evenings with others, they are not on the street at night and at the weekend and they get regular food. It is good to see several of our students in the same school, where they can support each other and travel to and from home together. I know they will work hard and do their best, which is all we ask. None of these students would be in secondary school at all without the support of their individual sponsors, for which we say a huge and grateful thank you. Some of our sponsored students do not get good enough marks to go to boarding school, in which case they go to local day school to complete the basic 9 years of education, assuming they get the requisite scores in the examinations. There are vocational options, again usually depending upon a good enough examination mark. If we can find an option to support our students to learn a trade we will support them, with the assistance of their sponsors. Other children who are supported by us into primary are guaranteed assistance to Primary 6 only. Finding our way through the system as our students progress is an interesting challenge. There are frequent changes and sometimes unexpected outcomes to which we have to respond, but we do what we can and I am proud of our collective achievements so far. Finally, some of you will remember Andre, who was supported through university and who gained a degree in Accountancy a while ago. He has been promoted and the bank obviously thinks highly of him. He was married last year and is now a proud father. I realize that I did not send a newsletter about the marriage which we all attended and will put that right very soon as I am sure it will be of interest to some of you. Meet Andre, Sandrine and Keriya. Hopefully she has a more secure future than Andre could have imagined when he was a young child in a remote village, far away from Kigali. Wishing you all Peace, Good Health, Happiness and Good Luck in everything you do.